he fights for right and the girl he loves! Pat Garrett kills Billy the Kid but the next day Roy Rogers shows up in town looking for a job as a Lawman. The local Deputys arrest him because they think that he is Billy, who he looks just like. The Sheriff doesn't belive Roy. Pat Garrett comes into the the Sheriffs Office and verifies that Roy is not Billy the Kid. Even though Billy was an outlaw that had killed 21 men by the time he was 20, the local Homesteaders help him escape the law because he is the only one that protects them from the crooked Cattle Ranchers that are burning their homes and stealing their livestock. The Sheriff is being pressured to keep the homesteaders (called Nesters by the locals) safe and to bring the crooked Cattle Ranchers to justice. 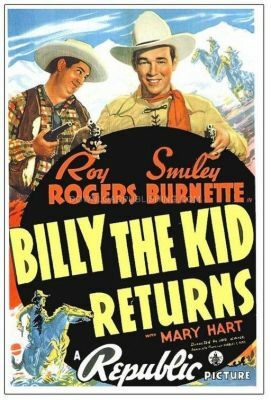 The Sheriff hires Roy to inpersonate Billy the Kid and help keep the settlers safe.